NEW: Clinton calls Kirsten Gillibrand "an intelligent and dedicated public servant"
WASHINGTON (CNN) -- New York Gov. David Paterson on Friday appointed relatively unknown U.S. Rep. Kirsten Gillibrand to replace Hillary Clinton in the U.S. Senate. Rep. Kirsten Gillibrand thanks Gov. David Paterson, right, after her appointment to the Senate on Friday. "I believe I have found the best candidate to become the next U.S. senator from New York," Paterson said at a noontime news conference in Albany, New York. 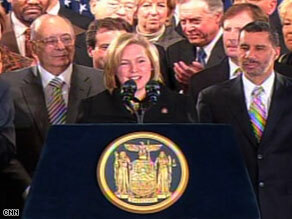 Gillibrand succeeds Clinton, who was sworn in Wednesday as secretary of state. "I aspire to follow in her footsteps, knowing her shoes I can only hope to fill," Gillibrand said of Clinton. Gillibrand comes from a well-connected clan: Her grandmother was a well-known political activist in Albany with whom Gillibrand campaigned as a girl. Her father is a lobbyist with ties to Republican former Gov. George Pataki. Her appointment to the Senate, effective Sunday, follows an apparently chaotic process that drew criticism from across the political spectrum. "Kirsten is an intelligent and dedicated public servant and a dear friend," a statement from Clinton read. "I'm pleased that this seat, which has been my great honor to hold, and which has in its history been held by leaders like former Sens. Daniel Patrick Moynihan and Robert F. Kennedy, will be in such capable hands." President Obama praised Gillibrand, too. "Kirsten has been a strong voice for transparency and reform in government and shares the belief that government should be open, accessible and work for all our citizens," Obama said in an official statement. Gillibrand, who will become the first upstate senator to represent New York since the late 1960s, is a stranger to most New Yorkers and a fresh face on Capitol Hill. She has served only one term in the House of Representatives, but her tough demeanor and upset win in a reliably Republican upstate district in 2006 immediately caught the attention of Democratic activists in a state known for hardball politics. While Gillibrand, 42, will represent one of the most progressive states in the country -- and has garnered solid union support and a 90 percent score from the American Civil Liberties Union -- the former antitrust lawyer and Clinton administration official is no dyed-in-the-wool liberal. The Albany-born Gillibrand currently represents New York's conservative 20th Congressional District. She's a member of the Blue Dog Coalition, a group of fiscally conservative Democrats. A supporter of gun rights, Gillibrand has been endorsed in her congressional runs by the National Rifle Association. She also supports an extension of the Bush tax cuts. The Catholic mother of two -- one of the few members of Congress to give birth while in office -- was an attorney before entering politics. She served as special counsel to then-Secretary of Housing and Urban Development Andrew Cuomo during the Clinton administration. Cuomo himself, now New York's attorney general, has consistently topped voter preference polls on the question of who should fill Clinton's Senate seat. Gillibrand's upstate district -- which starts in Dutchess county, at the northern fringe of the New York City suburbs -- shoots straight up the eastern side of the Hudson River, including Columbia and Rensselaer counties. It also includes Greene County, just west of the Hudson River in the northern Catskill region, and Delaware County, which is even farther to the west. The 20th Congressional District also includes Saratoga, Washington and Warren counties in the northern part of the state. It is home to Hyde Park, the one-time home of President Franklin Roosevelt. Gillibrand's seat was held by four-term Republican Rep. John Sweeney, and was considered safe for the GOP when she jumped into the race in 2006. But she ended up winning a brutal contest, 53 percent to 47 percent, and was overwhelmingly re-elected in November, 62 percent to 38 percent.